Because of Baltimore's close proximity to Washington DC I figured we would go explore the city for a day. However, the only thing the kids seemed interested in was riding around on the Metro. 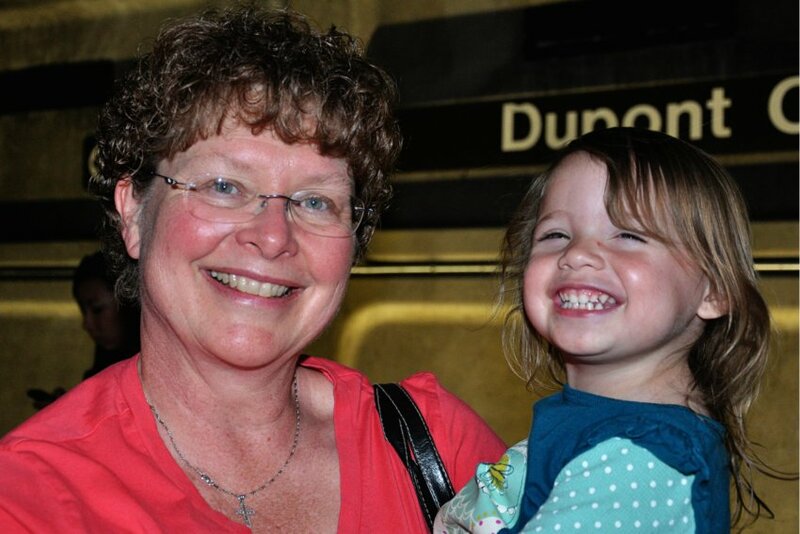 On Sunday morning we left the car at the Park 'N Ride and hopped on the Metro for our half hour ride into the city. Instead of just riding the Metro around all day as one five year old suggested, we decided to ride it to Dupont Circle to get lunch and walk around. We had ANOTHER fabulous lunch at Baja Fresh (we REALLLLLLY need one in North Carolina!!) and then walked over to the park at Dupont Circle. 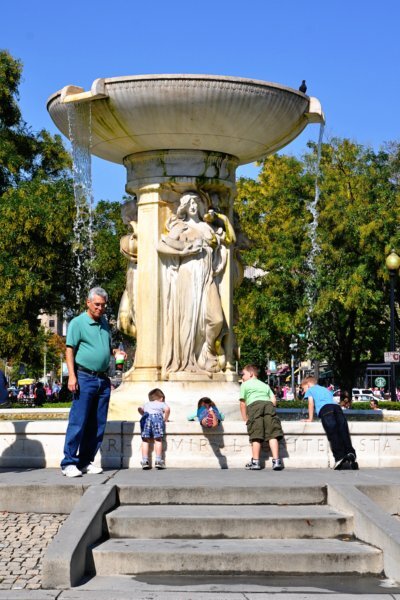 The kids were so enamored with the fountain in the center of the circle that you would think they'd never seen one. It provided a good half hour of entertainment before we dragged them away. 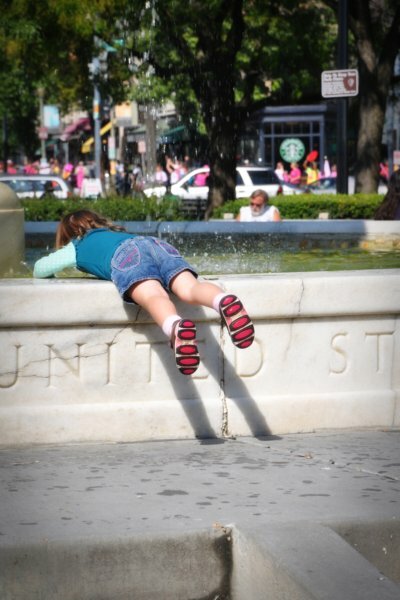 Lexie thought that the water in the fountain was hers to enjoy. She kept getting her hands wet and then fixing her hair. She also found EVERY puddle in the park to jump in over and over and over. The last part of the 3-Day for the Cure was going on so we walked across Dupont Circle to check out the action and cheer on the walkers. As we were crossing the street I saw Jen from The Amazing Trips. I've been reading her blog for the past 4 or 5 years and recognized her from her pictures!! I quickly told her hi and that I love her blog and as we were both crossing a busy street, we parted ways. We headed into Starbucks for a coffee break and then continued walking around Dupont Circle where we ran into Jen, her husband and 4 kiddos. 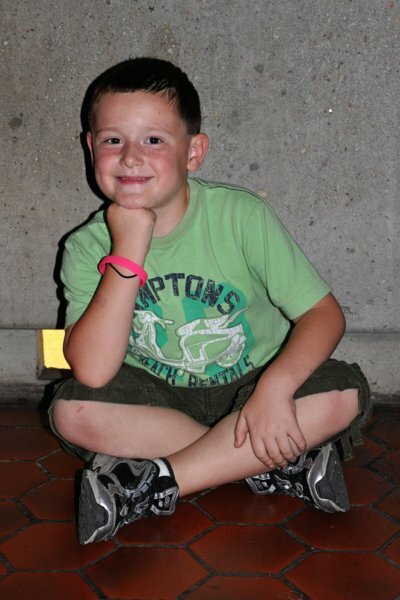 They were set up along the sidewalk and were cheering on walkers and passing out candy and pink bracelets. We chatted for about an hour while all the kids played and cheered. It was so amazing to meet someone who's life I've followed and enjoyed for the past few years. As she also has 4 kids (though three are triplets which I have absolutely NO experience with), I've been able to relate to what she writes about time and time again. It just goes to show how small this world really is! After we said goodbye to Jen and her family we made a quick ice cream stop at Ben and Jerry's and then went back to the Metro station. 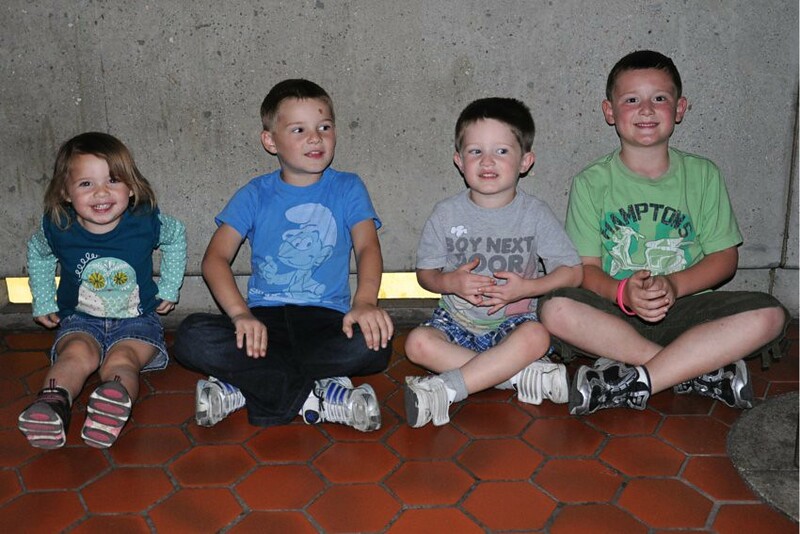 We had some time to kill before our train arrived so I figured I would try and get a picture of all the kids together. Well, with 4 bored and tired kids that's easier said than done. We headed back to the apartment for a quick rest before heading off again to meet Auntie Janne and Uncle Adam for dinner. We were introduced to the best crabcakes in Baltimore at G&M's. If you're ever in the area you MUST stop at G&M's for crabcakes!! At the insistence of one of my friends, we made a stop at Wawa on the way home. We needed to get gas for the drive home the next day so while Dad took care of that, Mom and I went inside for a cup of coffee and to see what all the hype is about. From the outside Wawa looks like most gas station convenience stores but once you walk in the doors it's amazing! There's a huge selection of fresh food, the coffee is delicious, and I've heard the made to order sandwiches are amazing-- I'll try one next time, Steph!! Wawa will definitely be my gas station/snack stop of choice when traveling through the mid-Atlantic from now on! After our stop at Wawa we went back to the apartment and everyone headed to bed. On Monday the kids and I headed down to Auntie Janne and Uncle Adam's in Oakton, VA, to check out their apartment and have lunch. Then it was time to hit the road and make the drive back home. Everyone was very excited to finally be home and out of the car. We had a great trip up to Maryland and can't wait to go back soon! It was a fun weekend- we'll have to do it again!